You have a great chance to walk on the beach... Oh no, run! Help the cat to run away from the big wave and try to avoid all obstacles here! Like grabs and sandcastle. Do not waste any minute and start to play it right now! Are you a good runner? We wanna to check it right now! 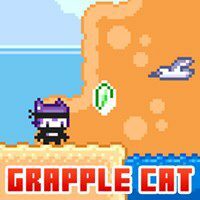 A distance based skill game and help the ninja feline out run a deadly tidal wave by running along the beach to escape a watery doom. Use your left mouse button to jump out of harm's way and to grapple with your hook whilst in mid air. Dodge sandcastles as they will slow your cat allowing for the tsunami to catch up and watch out for angry seagulls or kamikaze crabs attacking you on the hot beach. Do not forget to grab as many shiny emerald as you can when running along the sand.